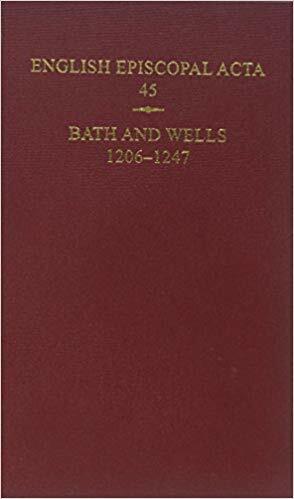 Author(s) Kemp, B. R.; Kemp, B. R.
This volume is concerned with two bishops whose pontificates differed hugely in length: Jocelin of Wells, 1206-1242, and Roger of Salisbury, 1244-1247. Bishop Jocelin's 36-year pontificate was among the longest in England in the thirteenth century, being exceeded only by those of Roger Longespée at Coventry and Lichfield (37 years) and of Walter de Gray at York (nearly 40 years). By contrast, that of his successor, Bishop Roger, was very short, lasting for a little over three years. Jocelin was the last bishop of Bath, Roger the first bishop of Bath and Wells. This volume provides for the first time scholarly editions of their 200 surviving acts, together with appendices elucidating their administration (particularly their use of dataries in their documents and their itinerariations around the diocese and beyond it). It also uses an extensive introduction to place these texts in the context of the bishops' lives and what they tell us of their work. In particular they consider the content of the material: content which allows us to touch the lives of ordinary men and women through the administrative records of their bishops, and the diplomatic structure of the acta, which provides information about the administrative and bureaucratic development of the bishops' chanceries and administration.